In my rush out-of-town for the weekend, I skipped over the adventure we enjoyed on Friday with visiting family. Three generations! My great-niece, Brooke, and great-nephew, Drew, each brought a friend, arriving with my niece, Tricia and my sister, Judy. 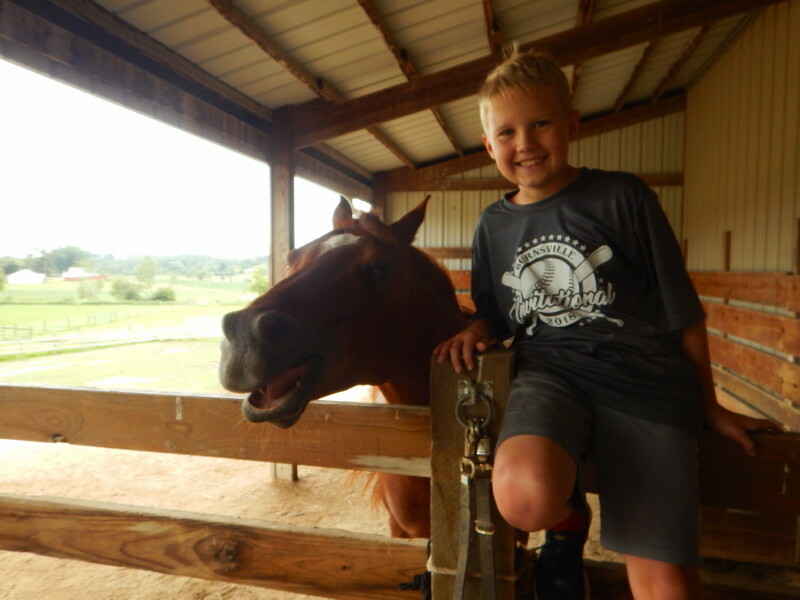 Friday morning started with significant thunderstorm, but by afternoon, the weather was pleasant for hanging out with the chickens and doing some exercises with the horses. Cyndie spent the rainy morning in the kitchen, baking fresh buns and some chocolate chip cookies. Combined with the snacks Judy and Tricia brought, and some brats Cyndie had grilled the day before, we had plenty of fuel for the adventures. Hunter was the star horse of the day, seen above making faces with Drew and participating in some communication connections in the round pen with Brooke. It is thrilling to witness the horse-human interactions as they play out. I think I get as much pleasure watching as the people who are engaged in the activity. It looked like Hunter was getting a fair share of pleasure out of it, too. 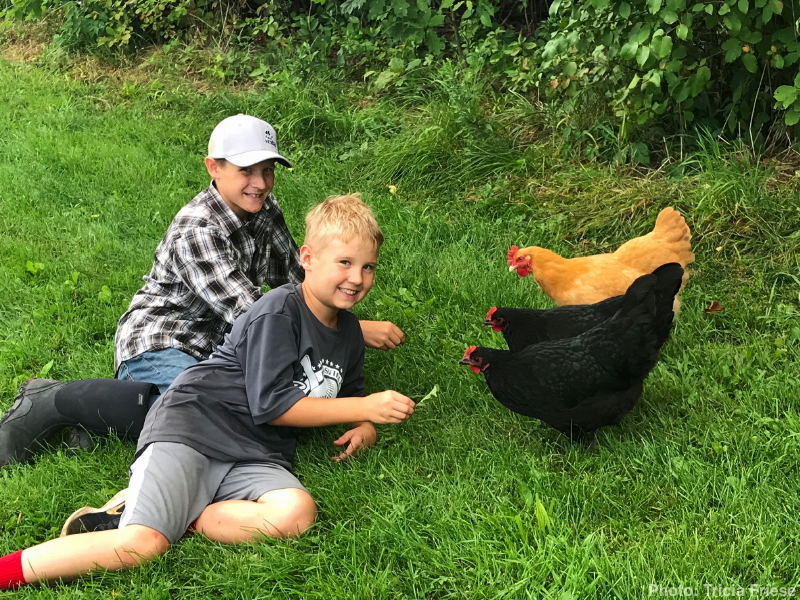 The chickens were pretty happy to have a lot of hands feeding them fruit scraps from Cyndie’s morning kitchen projects. That’s a much better way to dispose of food scraps that are otherwise commonly ground up in sink disposals and flushed into municipal waste water systems. Since we don’t have a kitchen disposal, if our food scraps don’t go to the chickens, they end up in the compost bin. Shortly after getting a bite to eat, I dashed off for the lake place, but I did hear the kids trying to negotiate their way into an overnight. There was too much fun to be had and not enough time to fit it all in. Their glee was so inspiring, it renewed my appreciation for everything our place has to offer. Living it day after day changes the perspective. It was refreshing to have their invigorating, contagious energy knock me from taking the adventure of this life for granted. I always say, this place never reaches its full potential until company shows up for a visit. 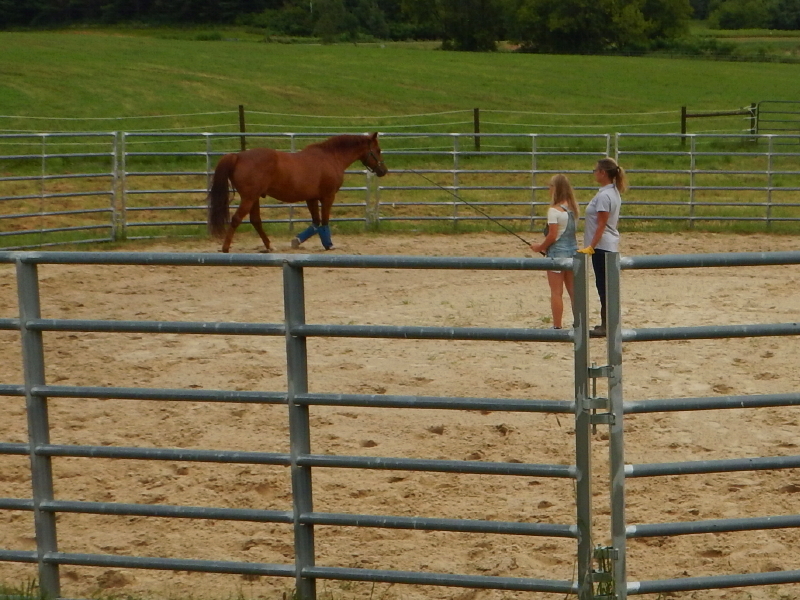 Especially when they are able to stay long enough to try out an exercise in the round pen with one of the horses. Thanks for making the trip over on Friday, Judy, Tricia, and kids! It was a blast having you here! You are so very welcome. It was a treat for us!